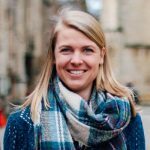 Miriam Swaffield is the Global Student Mission Leader for Fusion. She is an evangelist and communicator based in Middlesbrough but travelling all over the UK to equip the local church to reach students. She is passionate about this generation sharing their faith in the way they speak and live, authentically in their everyday lives alongside their mates. She is totally committed to seeing this happen through the local church and believes that justice and serving those most in need is a vital part of sharing the good news. Anything to do with students living for and with Jesus and she's in. Hence 'Just Love'. She is also a fan of Tom Christmas because of his surname.